The Head Gardener and I have been busy since last we blogged ... Day-um, has it really been 5 months??!! There's been a lot going on, both in and out of the gardens. More on that later. 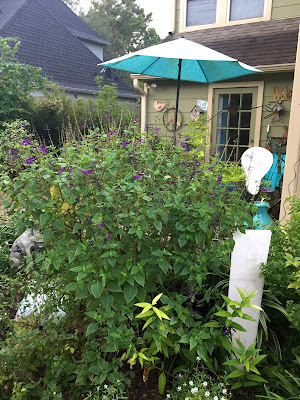 Right now it's Garden Bloggers' Bloom Day, hosted by my pal Carol of May Dreams Gardens, and it's time to show off what's blooming in our gardens. I was all fired up to get pictures of bauhinias, plumbago, echinaceas, cupheas, rudbeckias, asclepias, caesalpinia, aloes, russellia, calylophus, melampodium, cordia, justicias, stachys, anisacanthus, tradescantias, zinnias, and more. But just as I headed outside to get some photos of my best blooms for y'all, it started raining and I only had time to get a couple of shots. So October 2016's GBBD is a tale of two salvias, Mystic Spires and Amistad. It was my understanding that Mystic Spires would be a smaller, more compact version of Indigo Spires. Looking at this example, perhaps you are inclined to agree. Think again, my friends: this is one plant, after being cut back approximately 4 times this summer, most recently a few days ago. The bumblebees love the blooms and that is why I am loath to whack it back to bare stems. Salvia Amistad, I expected to get this big. The blooms are such a gorgeous deep rich purple, I just want to wrap myself in their color. It wouldn't be a good idea, though, since the hummingbirds would doubtless fight me for them. This has been the site of frequent and spirited hummingbird battles throughout the summer. No matter how tired I am of hot summer weather, my spirits are always lifted when I see the hummingbirds dive bombing each other above this plant. That's it for this Bloom Day. 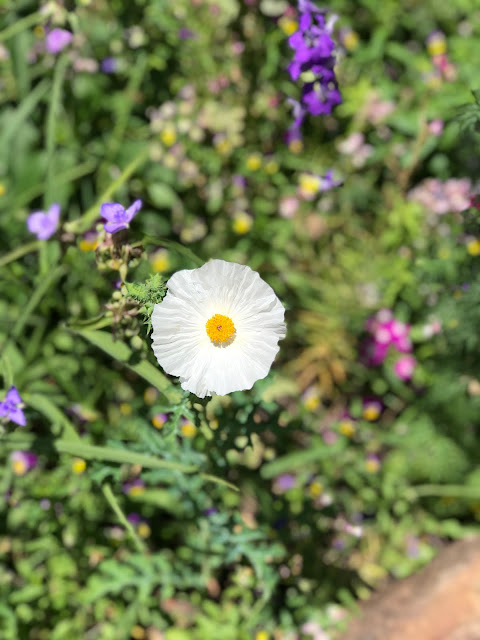 Take a look at the Mr. Linky list on Carol's post and see what's blooming in other gardens around the world. * Please ignore the scattered rocks, portions of black plastic pots and outdoor cushions visible in this picture. The Head Gardener is furiously rethinking the back garden and every day finds something else rearranged. The woman wears me out. Lovely. I'm all bloomed out on salvias so enjoyed seeing yours! Lovely! I am hoping someday to find a spot to squeeze in Amistad. It is beautiful there! 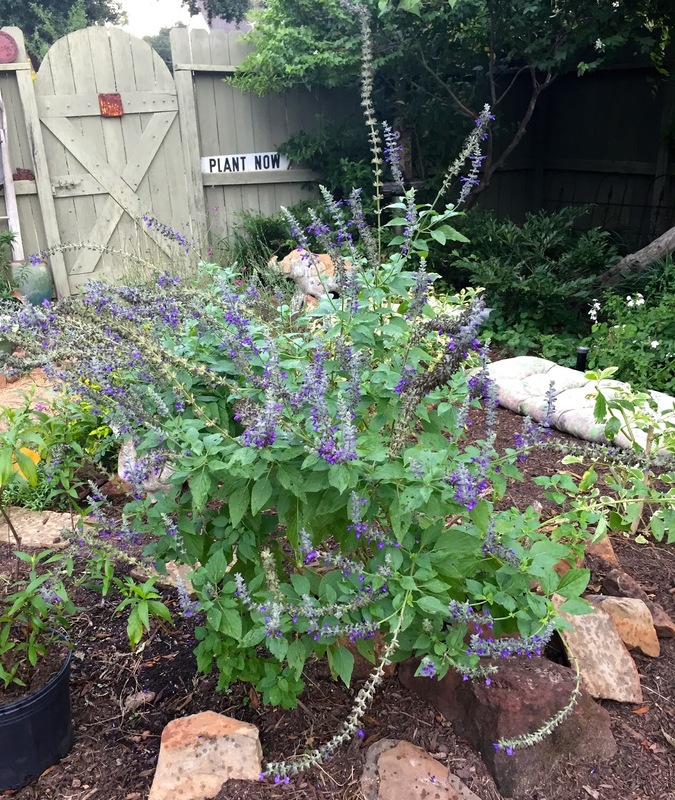 Salvias and hummingbirds sound like a winning combination. Happy blooms day to you and the Head Gardener! I remember seeing 'Amistad' in Scott's garden in Portland for the first time and falling in love with it, but I haven't had any luck finding it here. Yours is gorgeous! The little nursery in our small town has been carrying 'Wendy's Wish' the past few years, however. I think I bragged about it so much, I made converts of them:) It's been a hummingbird magnet all summer, too. Any plant that brings in the hummers and pollinators is a winner to me! I hope to see you at the Fling! I love looking at Bloom Day posts. At this point in my new garden not much is going on, but I have to say the Sheffield Daisies have gone through two hard frosts and even 3 inches of snow and are still showing off! Amazing.